Here we are, driving the B8RLE Euro 6 CAT (Central Area Transit) bus only moments before its delivery to the Public Transport Authority (PTA) of Western Australia. Let’s hope for an incident-free drive! Before the drive, I was told this new B8 CAT is a very lightweight, ultra-quiet eight-litre turbo-diesel on a Volvo B8RLE chassis – with Euro 6 low-emission technology and some pretty great claims made by Volgren about its buses; so I was interested to see how it achieved this and what sets a Volgren bus apart from the others. 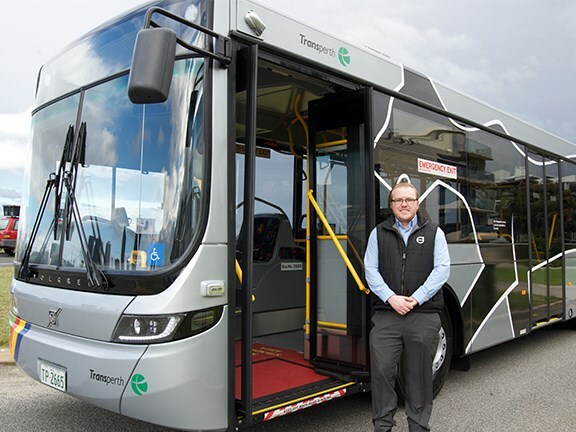 Volgren’s Western Australia state manager Matthew Smith says the bus will be used for Transperth’s central area transit, the CAT bus. This is a free service that runs around the central CBD of Perth. "This bus will operate on the free circuit and is funded by the City of Perth’s parking levy," he says. "This system is designed to encourage people to not drive into town and to use the free public transport provided to travel around Perth city." The buses all sport a feline-like logo and the routes are distinguished by four colours: red, blue, yellow and green. The services operate about every 15 minutes to different parts of the city and passengers can get on and off as many times as they like without paying a fare. This congestion-easing service has operated in Perth since 1996, and surprisingly, with the success of the system, we haven’t seen similar systems adopted in many more capital cities. Leaving the Volgren plant at Malaga, we headed to the stomping ground of this new CAT bus; this was its first drive before being handed over to the PTA. The paintwork and branding make these CAT buses an eye-catching combo, easily recognisable on Perth streets. The interior is surprisingly roomy, has bright colourful upholstery and paint trims, ample legroom and plenty of grab handles for passenger safety. This model has two double-door accesses for quick passenger entry and exits with sufficient room for disabled and elderly passengers. I have driven Volgren buses over the years at the depot I work at and have been really surprised at how well the interiors withstand heavy everyday wear and maintain their looks. I guess being a route bus you expect a certain level of basic necessities and not the luxury of its more elite competition, but the low level of internal and external noise was impressive and not something I would usually associate with an everyday operator ─ I had been told it was quiet but the level was unexpected. This, of course, would have a positive environmental impact as well as increasing driver and passenger comfort. 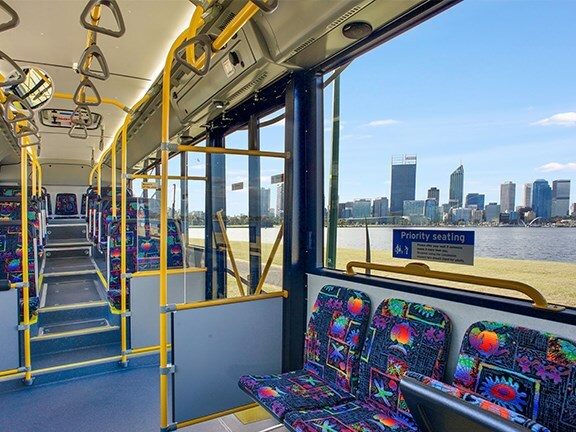 The B8RLE chassis is called a midi format with a shortened middle section to allow greater vehicle maneuverability; this would really benefit the driver in the busy Perth CBD with the constant quick stops and starts of the CAT service in traffic. Powered by a Volvo Group D8K engine, which in this application is rated at 320hp (239Kw) with 1200Nm of torque, you really notice that the combination is well-suited to this bus ─ but after a drive on the freeway I could see it comfortably handling more than just its city routes. When I asked Stuart Woodward from Volvo Bus Australia about the safety features, he told me: "This chassis has an EBS (electronic) braking system, and for the first time on a model mix within Australia on this chassis, we have incorporated ESP (Electronic Stability Program) on a low-floor bus which is standard on the 8-litre B8 low floor. Depending on customer requirements, we can also provide a fire suppression system that is used throughout the engine bay." From a driver and passenger safety aspect, Smith added that "the video security system used onboard is a great safety feature that helps protect both drivers and passengers onboard, and identify route and traffic problems and incidents as they occur". I had noticed there were driver cages on some of the buses; CAT buses mainly operate for tourists, workers and shoppers in the CBD, so the routes are considered low risk and cages are not required. They operate mainly in daylight hours through the week, with only the blue CAT route operating during later hours on weekends. Being cashless too, this also removes the potential danger of theft for drivers. As a bus driver, I am always interested to know how this bus considers the comfort of the driver, as I suspect driving in busy city conditions would be a sometimes stressful job. "Volgren have spent a great deal of time in collaboration with other operators in the industry to get input and feedback for the design of the driver’s area ─ to decide what are drivers looking for," Woodward says. 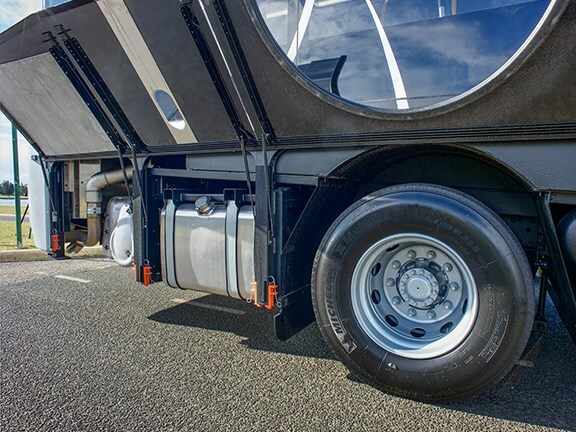 "That information has given rise to that whole future bus front area that has paid great attention to the detail of the ergonomics of the driving area. 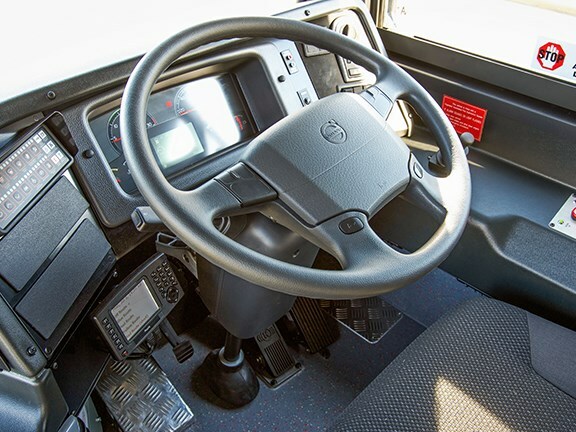 "There has been great consideration given to how the driver is sitting, the comfort of his seat … the spacing of the control area, and the number of times required to use the controls and perform certain functions, as well as the reach required to do so ─ everything that can be seen as repetitive and negative for long-term driver comfort and health has been considered. There are (also) booster fans provided for the driver from the air-con, heaters and a demister unit to ensure the driver is always comfortable," he detailed. With some buses it is the visual appearance or sheer power that impresses, but with this everyday workhorse it is the smart technology from the Co-Bolt framing system to the Volvo B8RLE chassis behind this bus that make it an impressive vehicle ─ externally simple in design but with the technology that makes the CATs anything but everyday. With a successful collaboration that benefits both the PTA and the people of Perth, I am sure the CATs will be roaming the streets of the capital for many more years to come. Volvo Bus Australia contracts and technical support manager WA, Stuart Woodward, says this new model will have a number of benefits for PTA. "Obviously going from the B7R ─ which is being phased out ─ to Euro 6 emissions standards to achieve cleaner emissions in terms of both gas and noise emissions, we also go to a complete in-house Group engine," Woodward says. "We have also seen a reduction in fuel consumption for like operations with the new B8R product in Perth, especially within the CAT operations. We have seven Euro 5 B7s in operation and we also have 20 Euro 6 B8s in operation already, and we have seen significant fuel reductions service wide. "We have already seen fuel savings of 3-5 per cent depending on which of the routes the bus is operating on. "So the thing to remember about the CAT operation is that it is a very demanding service in that the average speed required is between 10 to 12kmh, on average they stop approximately every 400m and the idle times are considerably higher at around 50 per cent. "In comparison, other standard bus services in the Perth area operate at a speed of 25kmh with an idle time of mid 30s. The CAT service is quite a harsh operation on vehicles," he explained. "The PTA did stipulate in their contracts with us (Volgren), a clause that they wanted to always be able to approach us directly with any problems or issues as they occur, and our location means that we can always be available for them," says Smith. "With Volvo, we also have an open-door policy … they can walk in at any time and audit our processes, and we regularly use that as fuel as to how to continue to improve further." According to Smith, Volgren employs 75 staff and that in itself has created about an equal number of jobs in the local area by utilising things like parts, transport and other services. "What this does mean for the local community is that we keep a core of specialised skills alive," he adds. "This is also important to the state as a whole … otherwise we would need to outsource for all these services and the skills die. This maintains capability and we can tackle just about anything required by our company," Smith proudly states. "The most prominent thing about a Volgren is the Co-Bolt aluminium system," continued Smith. "The fact that it is aluminium means that we can have a stronger, more durable bus on the road. Importantly, it’s modular, which means that repairs are faster, cheaper and easier to perform; this ensures the bus is more easily serviceable. "These two factors, when you look at the cost of the bus, mean that it requires very little ongoing maintenance because of the initial strength of the bus. "The aluminium Co-Bolt frame is virtually indestructible, it is a beautiful way to build a bus, (and) as a result, we are putting to the market something that we know is safe, durable and a quality product," he says. 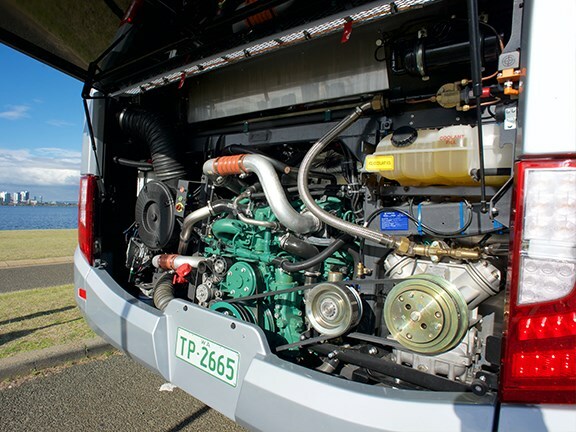 It’s this Co-Bolt system technology, Smith points out, that enables Volgren to build buses unlike any other on the Australian market, and gives its buses the technology they claim "has the power to change the industry". Volgren states that it has the lowest lifetime costs of any bus on the Australian market and backed this up by research undertaken by Monash University, Australia’s largest tertiary institute, with pretty astounding lifetime savings of around $60,000 compared to other buses taking part in the studies. So with estimated savings like that, the long-term partnership between the PTA and Volgren makes good business sense. being doing something right and something different to its competitors. Volgren’s partnership with PTA commenced in 1999 and has gone onto become one of the longest and most successful bus supply contracts in the history of the Australian bus industry. 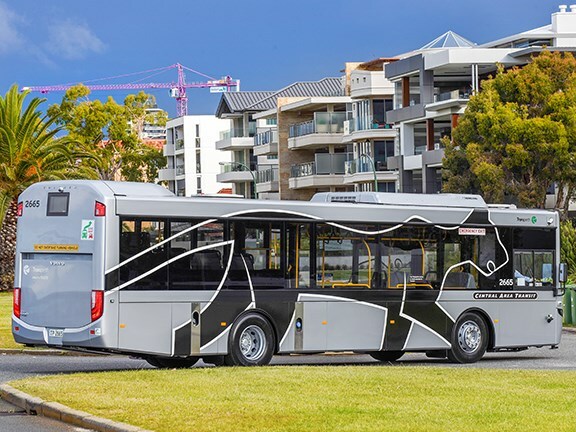 The success of this partnership has enabled the bus builder to establish and run its substantial manufacturing facility in Malaga, Western Australia.